This time of year I am so busy with fitting in all of the kids activities and all of the Holiday preparations that I have nearly all the hours of my day booked. After all, who can work, take care of kids, prep for the holidays, and be sane every day of the week all while having a homemade meal prepared for dinner? If you know someone, let me know, and tell them I need their secrets. For those of you driving the struggle bus just like me this holiday season I have a simple dinner that will make it easier to have it all together — or at least look as if you have it all together. Cheeseburger ‘n’ Fries Casserole. Yes I said casserole. Today most parents are all about the slow cooker and instant pots, but back in the day our parents and grandparents were all about the casserole. Casserole’s are great because they cook all in one dish, which means minimal clean up, and they are usually all tossed together which means minimal prep. This Cheeseburger ‘n’ Fries Casserole is very reminiscent of burgers and fries, but it can even fill that chili cheese fry craving. My kids loved this, of course, and so did my husband. It won’t win an award for the healthiest meal you will ever eat, but it tastes good, is warm, filling, and quick on those nights that your main goal is just to avoid the drive-thru. Another bonus is that it is perfect for shelf-cooking. If you are trying to use up things in your pantry and not go shopping. Or if you are planning simple and inexpensive meals on a tight budget week. This meal is so simple, you do not have to be a chef, or even enjoy cooking. It is a straight up simple meal that will impress without the extra fuss. It is making this momma’s life a little easier this holiday season, which is the best gift ever. Head on over to Taste of Home for the full recipe. It won’t disappoint. This entry was posted in Food & Recipes and tagged casserole, cheeseburger n fries casserole, dinner, easy dinners, easy meals, food, one dish dinner, recipes, simple dinners, simple recipes, taste of home, the boys store on December 19, 2018 by Lacy. We are at the end of Baseball season at our house, and we are just getting really busy with Football. So i try to incorporate simple meals that will keep my family happy, and keep me from extra work (and DISHES since my dishwasher recently decided to DIE!) So I have been very careful to choose dishes that did not require a lot of extra work. This fun recipe is delicious, simple, and is always a crowd pleaser at our house. Thank you to Valerie’s Kitchen for a delicious and simple way to cook Chili dogs for a Crowd. You can check out the full recipe now. Be sure to check out the other awesome food ideas when you’re there. Now I can make a simple a delicious dinner without the added dishes. Valerie even suggests lining the pan with aluminum foil for less mess. That’s a dream come true for this broken dishwasher momma. You never realize how important those modern conveniences are until they are gone. Its been nearly two weeks waiting for the broken part. Who knew that I would need to arrange meals around not wanting to do dishes? Well thank you Valerie for saving me time, frustrations, and dried out hands! Be sure to see Valerie’s other amazing recipes when you visit her site. I am already compiling a list of recipes to try at home! Enjoy! 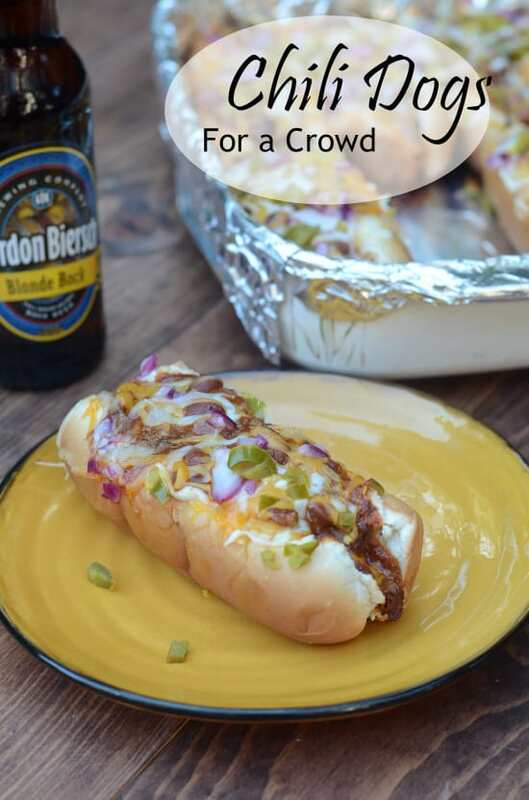 This entry was posted in Food & Recipes and tagged chili dogs, chili dogs for a crowd, dinner ideas, fall dinners, fall foods, fast dinners, food, food and recipes, one pot dinners, recipes, simple dinners, the boys store, Valeries kitchen on October 28, 2018 by Lacy.